When I moved to DC, my daughter was two and a half. I only had the one child and was still busy not wanting her to get run over and therefore mid the laborious process of instilling road sense into a small fever-footed toddler. Even if I had not still been attempting to be a good mother, as Europeans we all hear about US jay walking laws and I fully expected to be arrested at any point. I had been slapped by a bus driver for retrieving my change and discovered one needed to summons a member of staff to unlock the Johnson’s baby shampoo cabinet. I had seen a grown band boy scouts in their 60’s obediently waiting to cross a sleepy side road in Georgetown. As far as I was concerned anything could happen and probably would. It was therefore, to my considerable embarrassment that I discovered that in the US the signal announcing that it is safe for a pedestrian to cross is not a little green man, but a little white man. I am in a city that is predominantly black. Am I really supposed to tell my daughter to wait for the ‘little white man’? I might be imagining it but I feel the eyes of African American bystanders boring into me. I try “wait for the little flashing man”. This sounds even worse. 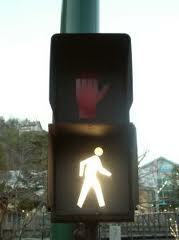 My uncle has long made me sensitive to the attire, or lack of it, of the personages who appear on traffic signs. The men in ‘Men at Work’ signs – if you check them closely – are actually naked, except for a pair of rubber boots. Now that I have my third child, although the desire to stop him getting run over has dwindled, I occasionally find myself asking him to look for the little white man and I still find it uncomfortable. We wait for the Demonic Hand which burns an impression into one’s forehead to sizzle out and then the politically incorrect little flasher comes on and it’s safe to go. It is all very disturbing and far from the sense and order of the little red man and the little green man whose colour logic is reassuring similar to that of other road signals. Now as it happens, my tenderness towards our green emblem of pedestrian safety is enmeshed with a strange incident that occurred to me in London in 1997. I was waiting for our little green man to light up so that I could cross the Embankment, a busy highway in the heart of London, when a real little green man popped up next to me. He was very small and clad from head to toe in green overalls with a green cap. He was also very congenial and hummed and rocked on his toes beside me. We stood waiting in this manner, side by side for his counterpart to appear. Then unexpectedly he leant close to me and in a hushed whisper said “The Grand National – put your money on Camelot Knight”. A happy lunatic I thought. At which point the green man on the far side of the intersection shone forth his blessing and I was free to go. 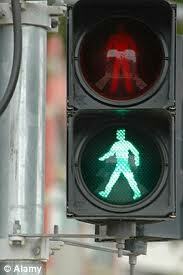 “Watch for the little green man’ chimed my companion impishly, as I began to cross the intersection. When I got to the central reservation I looked back. My friend was not following me and had disappeared. I could not see him anywhere on an empty street lined with enormous office buildings. It was really peculiar. I picked up a paper, sure enough there was Camelot Knight without a chance in hell of winning and an odds of 100-1. I have often put money on the Grand National and even won but this seemed too far fetched. I turned out to be very wrong. Camelot Knight, who was completely irrelevant even up until the last fence suddenly swept ahead to come in third after Lord Gyllene and Sunny Bay. Had I placed a bet ‘either way’ I could have won quite nicely. Think of the fun of it, a fortune made from a tip given by a vanishing green man. I tend to think he was my Leprechaun and that I missed his pot of gold thanks to a lack of faith which I will regret to my dying day. What he was doing in the financial district of London I cannot imagine, although pots of gold and financial centres do, now I think of it, tie in quite nicely. Given the years of monetary meddling and recent economic turmoil it is possible that there are teams of Leprechauns out there wreaking financial havoc. Who else would come up with the term ‘hedge fund’? This could explain all the hijinks on Wall Street. After all, the US offers fertile terrain for migrant Leprechauns; in fact it is a positive Leprechaun hothouse. On St Patrick’s day they don’t just wear a shamrock, they dye the Hudson river green. It is not just the pubs that seethe with brilliant green garments that make your eyes water, but the streets. If you can’t handle that green you opt for ‘moss’. Your Best Jewish Friend is discovered buying soda bread and Trader Joe’s shelves are loaded with corned beef and bangers. You may not celebrate Christmas, Hanukkah or Kwanzaa but you celebrate St Paddy’s or you are out on your pointed ear. Needless to say tales of Leprechauns abound. Even in our sleepy DC neighbourhood, strange footprints were found by the school trout tanks and the nursery school milk poured green to unsuspecting toddlers. So given this verdant furore, this national outpouring of love for little green men, surely it makes sense… to paint the little white men… green? Who better to enlist than a workforce of these small, green and presumably illegal aliens. They must be kicking their heals 364 days a year, why not provide them with some pots of paint and gainful employment? This entry was posted in Quill & Ink: Scrolls and tagged Grand National, Leprechaun, Pedestrian signals, Saint Patricks Day. Bookmark the permalink.